Third Overdrive playable now: Jimmy/Amy and the LUX5000! Jimmy, Amy and the Lux-5000 Toddletron are a mighty team. They have won numerous fights in robobrawls held in the many arenas and slums of Circuit City on Calias. 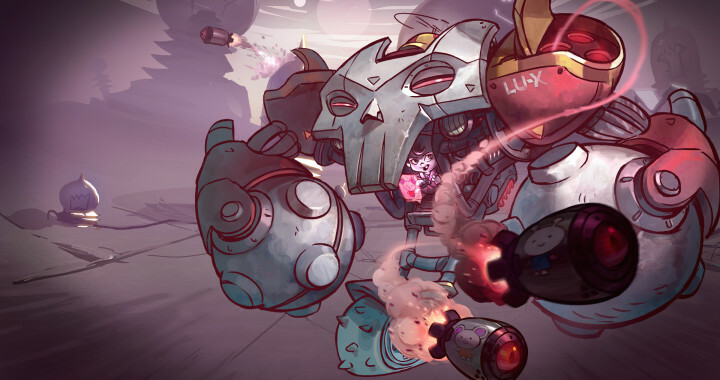 The twins love to crush enemies and cause mayhem with the LUX5000’s metal wrecking balls, which are basically two big rattles from their perspective. After each won fight Jimmy and Amy share a bottle of the finest Bovinian milk and watch cartoons before nap-time. Being big fans of the Awesomenauts they skipped the seasonal diaper league tournament and joined the team for some grown up fights. Just like the previous two Overdrive characters, Jimmy & Amy and the LUX5000 are playable in Beta in the run up to the expansion’s release. And the Beta is still open for every owner of Awesomenauts! To get into the Beta, check out the instructions here.